Location: The Wilson's Creek Civil War Museum [ Waypoint = N37 07.282 W93 25.244 ] is located at 5228 S State Highway ZZ in Republic, Missouri 65738. It is just north of the Wilson's Creek National Battlefield. 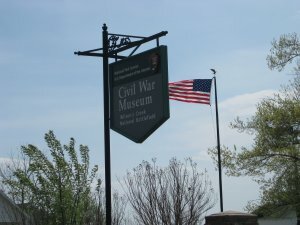 Description: This museum used to be called General Sweeney's Museum of Civil War History before it was acquired by the National Park Service in 2005. The museum has on display numerous artifacts and weapons of the war in the Trans-Mississippi, more familiarly known as the area west of the Mississippi River. The collection consists of several thousand artifacts that have been accumulated over the last 40 years. Several large displays tell the story of the battle of Wilson's Creek. View artifacts from this battle, along with weapons, a uniform, photographs of participants from both sides. For those interested in weapons, we offer a wide variety used by the infantry, cavalry and artillery, as well as the fresh water navy on the Mississippi and other inland rivers. Several display cases are devoted to medicine as it was practiced during the time. A number of flags are also displayed, including a rare Cherokee Indian Confederate Flag.